One thing I can’t help doing is dreaming big. For my travels this means that the initial plan is always much larger than what actually turns out doable. In the spring of 2018 I was sitting at our dining room table with my wife and father-in law to discuss and decide our route for the planned three-week trip from San Francisco to Seattle in late June and early July. As usual, I had done some research and stared at maps for hours – the result being a bucket full of places that we should not miss. The flights were booked, the RV rental was arranged and the time frame was set. For an hour we tried to squeeze all locations into the route, a task that turned out impossible. So, as usual, the first act was a much needed diet of places, boiling it down to a handful of essentials that we could actually visit and enjoy. Some seriously dramatic light in the afternoon at Lake Tahoe. Our initial night was spend on the south shore of Lake Tahoe. It’s a bustling place, full of tourists and corresponding infrastructure. This could not spoil the wonderful scenery though and we had a great time acquainting us with life on the road and the landscape. From a photographic point of view, the south shore of the lake is not particularly impressive. The lake is huge and the surrounding mountains on the western shore shrink considerably when you choose the wide angle approach. At the same time the shore does not lend itself to working with foregrounds very much, so in the end this a place where your best bet is the light. Clouds reflected in the lake with some complementary background and foreground is the way to go. I was more concerned with having a meal on the campground with the family and enjoying the view across the lake than with scouting for the ideal spot to capture it, but I snapped a few photos anyway. The road took us north following the western shore of Lake Tahoe, passing the spectacular views of Emerald Bay and the quieter walkways of the Taylor Creek marshlands. We have some miles to make so we did not stop for longer explorations except an hour of leisurely walking at Taylor Creek. In the afternoon we stopped at the gorgeous Sierra Buttes, a northern outpost of the Sierra Nevada fold. 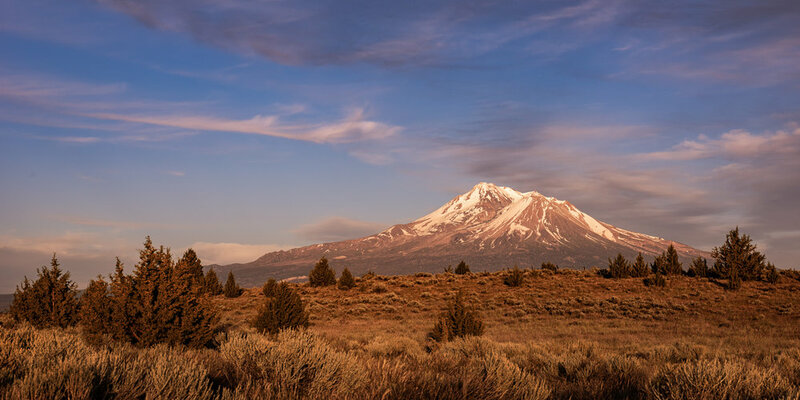 The region is the transition zone between the Sierra range with its folded granite, sharp peaks and glacial valleys, and the volcanic Cascade Range. 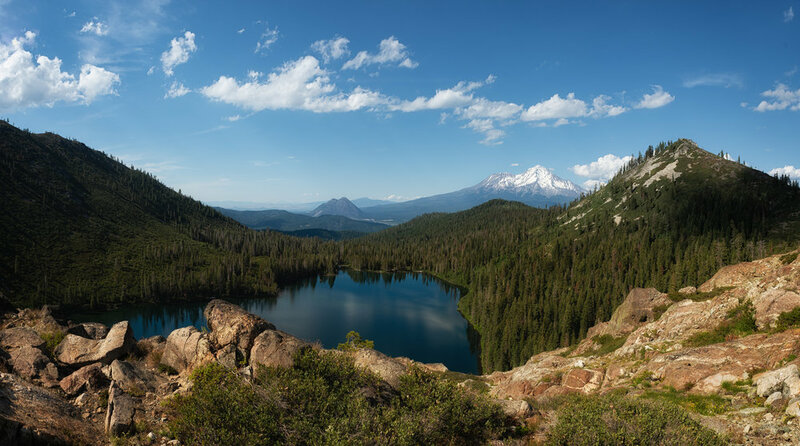 The Upper and Lower Sardine Lakes just below the cragged Sierra Buttes Massive is a refuge where wilderness experience is easily accessible to anyone from small children to seniors. The spectacular backdrop of the picnic area made us change our plans immediately and we stayed there the whole afternoon, swimming, basking in the sun, having a snack and a snap! Vacations had officially begun there. Lower Sardine Lake below the Sierra Buttes. Late in the evening we reached Lassen Volcanic National Park, the first stop on the tour that has been a non-negotiable part of my initial trip itinerary. While part of the reason for that is the work on a project that I have not yet disclosed, the other part is simply the curiosity for new horizons. We stayed at Butte Lake in the Cinder Cone area of the park which boasts several volcanic features that I have never seen or walked along before. The soft and cushioned feel of the ground of our campsite heralded the vast expanses of volcanic ash we would explore the next day. The vicinity of the campground was a wonderland for me already: the soil, the lichens, the pyroclastic stone, the fir cones, and the deer that roamed the campground would have been more than enough to explore. Nonetheless we embarked on a short but demanding hike the next morning. The finish line was the top of Cinder Cone – which turned out to be a perfect cone of volcanic gravel and ash, just like its name implies. Before that we walked along the Fantastic Lava Beds, a vast area of basalt lava flows that originated at the base of Cinder Cone. The division between the forest and the flow is abrupt. As if the event had happened only a few months ago, the lava beds cover the landscape and the vegetation just like a giant blanket. Its age has been the in the center of a controversial debate for decades, only recent studies we able to precisely date the flows. The Cone and the associated lava flows formed during two eruptions that occurred in the 1650s, according to the U.S. Geological Survey. Standing on the 10-meter high edge of the flow, this is astonishing. I have never felt so close, spatially and temporally, to the inner workings of our planet. Walking up a postcard is much harder than it looks: the base of Cinder Cone, Lassen Volcanic National Park. Once we passed the Lava Beds, we were ready to approach the 230 meter high Cinder Cone. Under the relentless sun and walking on 45 degrees of loose gravel, this was a much greater challenge than one might think. Two steps forward, one step sliding, two steps forward, catch a breath and swipe the sweat from the face. Repeat. Repeat. Repeat. But there was some joy in the ascent whenever I managed to raise my head and take a look at what has been revealed by moving up another few meters. On the one side an astonishing vista of Lassen Peak, the highest point of the park, started to unfold. On the other side the most photogenic part of the cinder cone area came into sight: the bird's- eye view of the Painted Dunes. Yes, that is just as amazing as the name suggests: brilliantly shaped and colorfully marbled dunes made of volcanic ash with trees popping out every now and then. The dunes resemble rolling, soft hills rather than its sharp-edges cousins in the Death Valley or in Namibia, but that does not take any of their appeal away. 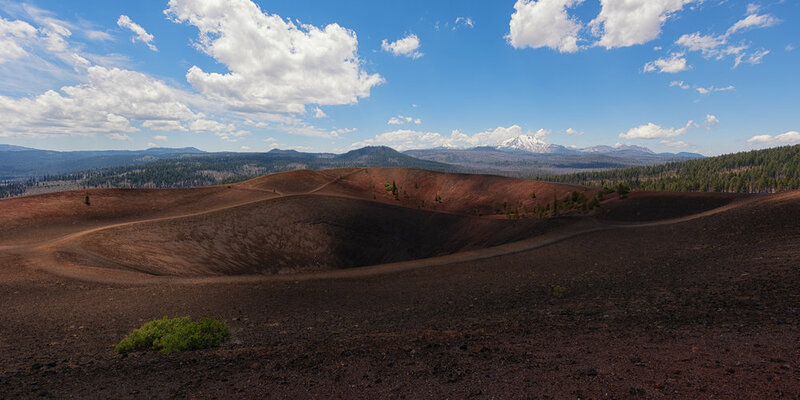 The Painted Dunes and the Fantastic Lava Beds as seen from the top of Cinder Cone, Lassen Volcanic National Park. Once up Cinder Cone, you can enjoy a leisurely walk around the rim, take a look into the crater (nothing overly exciting in there) and let the 360 degrees view of the National Park sink in. Photographically, this is a spot where something works under any circumstances. The view towards Lassen Peak calls for strong light, either with the sun in the early morning or right into the sunset. Patchy skies make the rim of the cone a wonderful subject to play with sunlight and shadow at any hour of the day. On sunny days, the view onto the Painted Dunes is terrific as the hills respond very well to direct light casting alluring shadows. Of course, a mix of sun and clouds also is of help here, as dappled light on dunes is some of the best things in the world. The crater of Cinder Cone looking in western direction towards Lassen Peak, who gave its name to the National Park in Northern Californa. 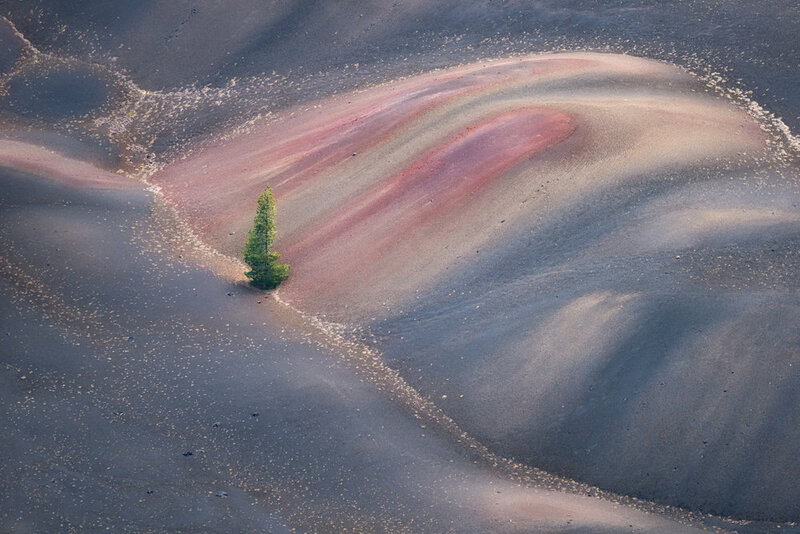 Photographer’s candy store: the Painted Dunes of Lassen Volcanic National Park. We left Lassen in the afternoon for our next stop: Mt. Shasta. Coming from Europe it is easy to underestimate driving distances in the US. It always a little closer when you measure distances in miles rather than in kilometers – and in a huge country the maps always tend to play down actual distances. So we steered the large RV through charming remote routes in Northern California when we suddenly realized the long drive was all worth it. After a soft turn of the road a HUGE mountain appeared on such short notice that we had to pull over and stop the vehicle immediately. Coming from a region dominated by fold mountains – where summits form ranges rather than mimic the Lonely Mountain from Middle-Earth – we entered the volcanic Cascade Range. Despite its name the Cascade Range is not a mountain range in the sense of their formation, it is actually a series of individual volcanic peaks that formed on a line of geological activity that is part of the pacific “ring of fire”. That means the Cascades a mostly large forested valleys with picturesque lakes, streams and waterfalls – and every now and than a volcanic massif that dominates the landscape within a diameter of often a hundred miles. Mighty Mt. Shasta makes a dramatic entrance. Mt. Shasta is a perfect example for what I described above. With a height of 4322 meters (14,179 ft for my non-metric American friends) is the second-highest peak in the Cascades and boasts a prominence of nearly 3.000 meters (nearly 10,000 ft). Prominence means the relative height of the summit to its surrounding landscape and is an indicator for how singular the mountain is in its vicinity. I guess the numbers make clear that Mt. Shasta qualifies as the godfather of prominence – it is only surpassed by Mt. Rainier and Mt. Whitney in the contiguous US. But that also makes clear that we – although already blown away by the mountain on our little forest road – still had quite a distance to cover before actually reaching the mountain. For obvious reasons I chose the Lake Siskiyou Resort campground as our place to stay at Mt. Shasta. The view across the (artificial) lake towards the west face of the Mountain is one of the iconic views of California and the campground is perfectly situated to harvest the low hanging fruit. Talking of food, our first thing to do at the campsite was starting a fire and preparing delicious flame-grilled burgers. Sitting at a picnic table, listening to the crackling of the wood, breathing fresh mountain air and taking a bite of luxury-style homemade burgers is an experience that more than equals the joy of capturing a great photo; the very essence of outdoor family vacation. But as you might have guessed, I could not let the sunset be a sunset. So after the final bite I rushed to the small beach of the resort and scouted for compositions. Quickly it became obvious that there was no winning shot to be made this very evening because the light was flat and the mountain covered in clouds – some of the very few that we saw on the entire trip. So I was not completely upset when a campground manager prompted me to leave the beach a few minutes after my arrival. They close the beach and enforce it after a child drowned while swimming unattended a few years back. The good light was not happening on Mt. Shasta anyways so I made a quick decision and headed for the northern end of the campground, hoping to get a view of a west-facing bay with a little bit of nice light. Luck was on my side and quite a show developed for a few minutes in the west. No über-prominent mountain in the frame, but clearly a classic reflected sunset with that special sense of wildness and adventure. Smile, snap and time to hit the pillow – my plan for a sunrise shoot was made. The B-side of Lake Siskiyou with Mt. Shasta behind me: not to bad either, in my humble opinion. Next morning was an early one with a sunrise around 5:30 AM. The target was not a very original one as the scene has been photographed over and over again. Sometimes standing in the footsteps of thousands of other photographers feels nice, though. Arriving at the beach an hour before sunrise I could see that this spot is famous for a reason! It is a glorious view, dramatic, clean and inspiring. The clouds of the previous evening had vanished and revealed an unobstructed view of the massive mountain. As the morning progressed, very few clouds appeared and softly complemented the intense blue hour light. At a place that screams “drama” this was a rather subdued sunrise, but for me it was an unparalleled experience. A perfect morning at Lake Siskiyou enabled me to shoot my version of an iconic scene. Although we had our next three nights booked at the Redwood Coast we decided to explore the Shasta region for the entire day. After jumping into the lake after breakfast we headed for the town of Mt. Shasta and took the road south towards the Castle Crags State Park. West of Mt. Shasta the Coast Mountain Range of California reaches its most inland point. The Castle Crags Wilderness, the Trinity Alps and the Marble Mountain Wilderness are only a few spots in this large mountainous region. It is not as high as the volcanoes of the Cascades or the summits of the Sierra Nevada, but the vast number of valleys, lakes, streams and waterfalls and the high degree of forestation make this region a region to get lost in – in a good way. We only had the opportunity to scratch the surface by conducting a short and a longer hike. The first destination was the spectacular Sacramento River near the small village of Dunsmuir. It is home to one of the most famous waterfalls of the entire State, even the entire Pacific Northwest. Mossbrae Falls is a stunning sight, but access is difficult as it lies on private ground and the trail is not marked. As we wanted to avoid any legal issues and did not want to spend the day with route-finding (remember we were a party of five with two children aged 3 and 5), we opted for a more easily accessed waterfall, Hedge Creek Falls. Hedge Creek is a small tributary to the Sacramento River and falls ten to twelve meters into a small bowl. The bowl is made of basalt and represents the southernmost end of lava flows from Mt. Shasta. “Have you ever walked behind a waterfall?” I get the expected “No, never!” answer from my kids as we scrambled the path down into the river bed. In the spirit of seeking experiences that we never had before we explored the Hedge Creek Fall and the small cave behind it. There were rocks to scramble on for the kids and beautiful perspectives for the photographer. Blue skies at noon do not lend themselves very to photographing in a forested canyon facing south but hey, we were after the adventure and not (primarily) after the shot – although, I must admit, I’ve put this place on my already-way-to-long return list of locations. A misty and cloudy day in autumn must be great here. Charming Hedge Creek falls with difficult direct light. I liked it nonetheless! The end of the short trail is a viewing platform over the Sacramento River with nice views into the lush forest and even a glimpse of mighty Shasta over the trees. This was perspective number three of the volcano and we were hungry for more. We decided to drive all the way up to Castle Lake, a stunning mountain lake in the Castle Crags Wilderness. The lake shore is quite busy with a parking lot and a small campground, but as soon as you start hiking you immerse yourself in the wilderness – which we did, although afternoon was coming quickly. For the next hour we gained height meter after meter in search of Heart Lake, a tiny pond high up in the mountains above Castle Lake. We never found it, but the hike was one of the best I ever made. The trail was gaining height quickly as we walked through the forested eastern shore of Castle Lake. Reaching 2000 meters elevation the trees disappeared and gave way to bushes and boulders. We looked for Heart Lake on a granite plateau several hundred meters above Castle Lake, jumping from boulder to boulder. Instead of stumbling upon the pond, we found a mesmerizing vista of Mt. Shasta, Black Butte and the Castle Crags Wilderness with the lake just below us. What a view: inside the Castle Crags Wilderness overloking Castle Lake towards Mt. 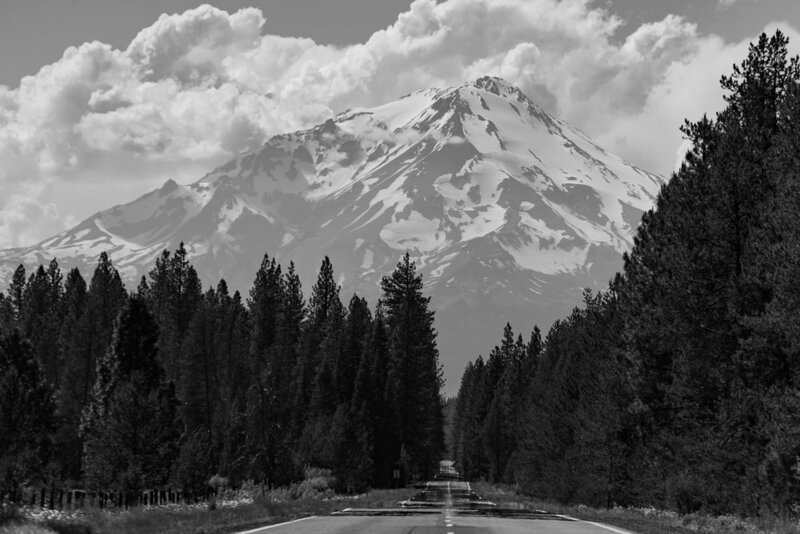 Shasta and Black Butte. The view was a sight to behold, yet it was not the most exciting thing up there. Hiking with small children is a challenge but yields incredible rewards. Our big girl was fixed by reaching the top and rushed the trail with her grandpa. It was such a joy to see her feeling totally comfortable and happy in the wilderness. When she made it to the plateau like a champ I asked her for a photo. I only snapped it with the phone, but it still moves me to tears. I’m proud that both parents and nature seem to do a fairly decent job in making her a confident, curious, cheerful and resilient person. What are new horizons for me, are completely new worlds for our kids. She explored and discovered like a champ! We finished our descent by six in the evening, had a well-deserved dinner in the motorhome and started the long drive towards the Redwood Coast half an hour before sunset. Driving north on Highway No. 5 the Lonely Mountain was not ready to let us go. I stared into the rear-view mirror as the sunset unfolded and the light on the mountain got prettier and prettier. After 15 painful minutes on the highway I could not bear it anymore and commanded a full stop. We left at the next exit and drove into the surrounding farmland for a minute. I did not have the opportunity to scout for exciting composition, but sometimes ten minutes of in-your-face-light and backdrop have to do. Boom! Mt. Shasta bathing in golden, glorious light a few minutes before sunset. Once again, Mt. Shasta at the very moment of sunset. In the following four hours we learned a lesson: Never underestimate driving distances. It was not that far from Shasta to Crescent City at the Pacific Coast – as the bird flies. But roads do not follow straight lines in this part of the country and in the Coast Mountains you do not have many choices. So we drove small roads through the endless forests and mountains following the Klamath River, taking a right turn in a small community called “Happy Camp” and reached the coast at 1 AM. When driving into Redwood country on the 199 from Oregon you reach Jedediah Smith Redwoods State Park first. So did we around midnight and all of a sudden, only a few centimeters away from the road, a GIANT tree appeared. It was so massive, so unexpected and so close that my wife jumped on the brake pedal. The circumference of the trunk would have covered our huge RV without a problem. What a heart-pounding way to be introduced to the world’s largest trees. Anyone fancy seeing something he’d never seen before? I certainly did! The rhododendrons of the Redwood Forests in filtered, yet direct light in the Del Norte Coast Redwood State Park. The following two and a half days were completely dedicated to the Redwoods. We stayed at Mill Creek Campground in Del Norte Coast Redwoods State Park and explored the northern stretch of the Redwood Coast from this base. First on our agenda was the Damnation Creek Trail, which is said to offer the most striking views of the giant sequoias due to elevation change. There is no denying this! From the Highway 101 which crosscuts the Redwood parks from north to south the trail leads through an impressive old-grown forest of Redwoods and descends for 3.5 kilometers until you reach the ocean. Starting at an elevation of a little over 350 meters you obviously go all the way down to sea level – and all the way up again on your way out. As if one tree is not wide enough, I managed to squeeze three of them into one frame. On the second part of the trail the Redwoods become rare and a mixed conifer forest with specimen that are no less giant and impressive. The slope is said to encourage the formation of mist in the forest which makes this part of the Redwoods the best bet to photograph the trees with the alluring foggy mood. Having said that, I must say that the god of the blue sky was relentless and spoiled almost every attempt to capture more open views of the forest. For practical reasons staying well after sunset was not an option, neither helped the sunny weather, so I learned to enjoy the scenery without the camera and to find smaller scenes that equally attracted my eyes. It’s not easy to look down when the giant trees lead the eyes upwards, but there is beauty to be found in the details on the ground. 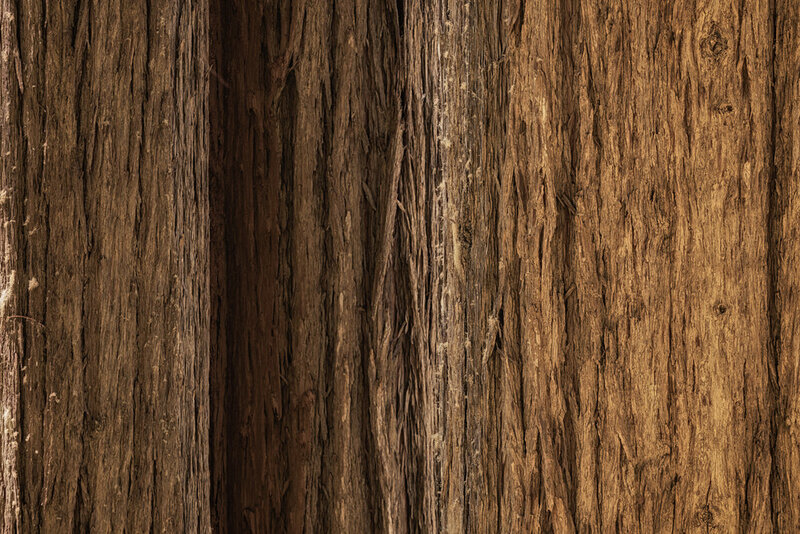 Giant trees are stunning not only by their sheer height, also is their bark an abstract painting. This is pretty much the story for the entire three days at the Redwood Coast. Experience level high, photography opportunities scarce. Nevertheless this has been another mind-blowing stop on our trip. Just seeing the kids climbing a fallen tree that is 5 times their height in diameter is something that I do not want to trade for anything else. In just a week we did so many things for the first time, experienced adventure and fun, and could not believe our eyes more than once! With great anticipation we crossed the border into Oregon on the eight day of our Journey. Oregon! The name alone evokes more adventures to come! Surf and soft sunset light at the Redwood Coast get me in the right mood for the following days of exploration in Oregon.